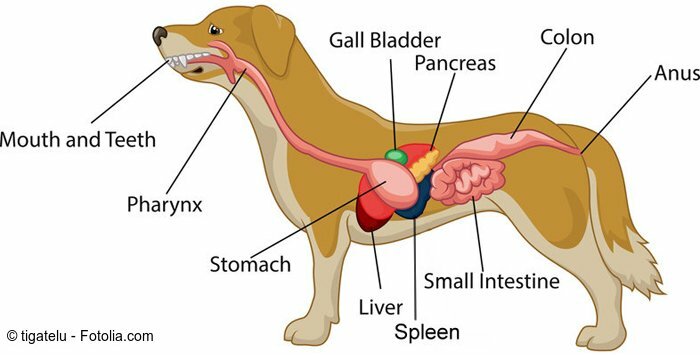 Pancreatitis in dogs - How to diagnose and how to avoid it! The pancreas is a relatively small organ in the body, which plays a vital role in controlling blood sugar and also releases potent enzymes that digest food into smaller particles prior to absorption. These enzymes are generally stored in small vesicles (enclosures) and only released during digestion. Pancreatitis essentially means inflammation of the pancreas. It may occur for a number of reasons but in most cases it results in release of the potent enzymes, which are normally inactive until they reach the small intestine, becoming active in the pancreas instead, initiating a series of events where the pancreas actually digests itself and adjacent tissues. This leads to worsening of inflammation; the pancreatic enzymes also appear in the blood circulation. Sometimes the enzymes can damage the lining of blood vessels, which can lead to bleeding. In severe cases of pancreatitis, shock is not uncommon. Is there any dog breed prone to pancreatitis? Dogs of any breed, size, or age can develop pancreatitis. More cases have been observed in pet dogs than wild dogs, primarily because of the type of food they are eating. Overall, pancreatitis tends to be more common in middle-age to elderly, overweight, or female dogs. Some canine breeds, especially miniature schnauzers, cocker spaniels, and miniature poodles are prone to developing the problem. How does pancreatitis in dogs present? The dog is lethargic and will prefer to lie down. If pancreatitis remains persistent, there is significant weight loss. What increases a dog’s risk to developing pancreatitis? If you live in Arizona, Texas or New Mexico, scorpion stings can cause pancreatitis. Even though the venom is tiny, it is potent and can cause mild to moderate pancreatitis. Raised levels of blood calcium can result in damage to the pancreas. Are there any foods that cause canine pancreatitis? One of the most common causes of canine pancreatitis is the diet offered to these animals. Foods that are concentrated with saturated fats including cholesterol are frequently associated with pancreatitis. The other thing that also contributes to pancreatitis is feeding human food to the dog because many are rich in oils and fats. How is the diagnosis of pancreatitis in dogs made? Checking for levels of calcium and cholesterol in blood. Measuring levels of pancreatic enzymes in blood. Sometimes an x-ray of the abdomen is done to look for precipitates of calcium around the pancreas. If a mass or some type of injury is suspected, an ultrasound of the abdomen is performed. Can pancreatitis in the dog be treated at home? Pancreatitis is a serious disorder that can rapidly turn fatal. Only the mildest cases of canine pancreatitis are treated at home after the dog has been examined by the veterinarian. The basic treatment of pancreatitis involves dealing with the specific cause of the problem. If it’s related to the dog’s diet, the vet may put the patient on prescription food; if it’s a reaction to a certain medication, the dog may be taken off it. But in many cases, it’s difficult to pinpoint the underlying cause, thus the treatment regimen is focused on addressing the symptoms and keeping the dog as comfortable as possible. Which dogs with pancreatitis need to be admitted? Most dogs that develop moderate to severe pancreatitis will not be able to drink or eat. This can quickly lead to dehydration and shock. Thus an intravenous is needed to administer fluids. Depending on the severity of pancreatitis, the dog may require admission for 2-7 days. Dogs that don’t respond to medication may need surgical exploration of the abdomen. Typical problems that require surgical intervention include severe inflammation of the pancreas and other organs of the abdominal cavity, pancreatic obstructions, and pancreatic abscess or mass. Mind you, these dogs are very ill and mortality rates are also high. What is recovery like from canine pancreatitis? Once the dog comes home it is important to allow the pet to rest. After a bout of pancreatitis, recovery can take 7-30 days depending on its severity. The dog will usually be exhausted and tired. Physical activity must be minimized. Pain medications are administered according to the vet’s instructions. Make sure the dog has easy access to fresh clean water. Your vet will give you instructions regarding your dog’s diet to avoid over-working the pancreas while it is still healing. What type of foods should be given after a bout of canine pancreatitis? It is important to avoid foods high in fat and protein content, as these foods stimulate the release of enzymes, which can trigger pancreatitis. Instead, there are several types of commercial dog foods that are high in carbohydrate and low in fat content. The prognosis depends on the severity of the pancreatitis. Considering that pancreatitis can be a life-threatening problem, mild cases usually have a fair prognosis when appropriate treatment is given. Severe cases, especially those involving concurrent illness or complications have poor to guarded prognosis. How can I prevent pancreatitis in my dog? Pancreatitis in dogs is a serious illness and all dog owners should learn to recognize the symptoms. The earlier you bring the dog to the vet, the better is the prognosis. If you believe that there’s anything missing in this post, please share in the comments!